YATE TOWN were formed in 1906 as Yate Rovers, layer becoming Yate YMCA, then taking their current name of Yate Town in 1969. The year before that they were founder members of the Gloucestershire County League. They made the step up to the Hellenic League in 1983, moving up to it's Premier Division a couple of seasons later. By 1989 they were in the Southern League and have stayed there apart from 3 seasons back in the Hellenic League when they were relegated at the turn of the century. They soon recovered and in 2006 had their best ever finish of 6th in the Southern Premier. 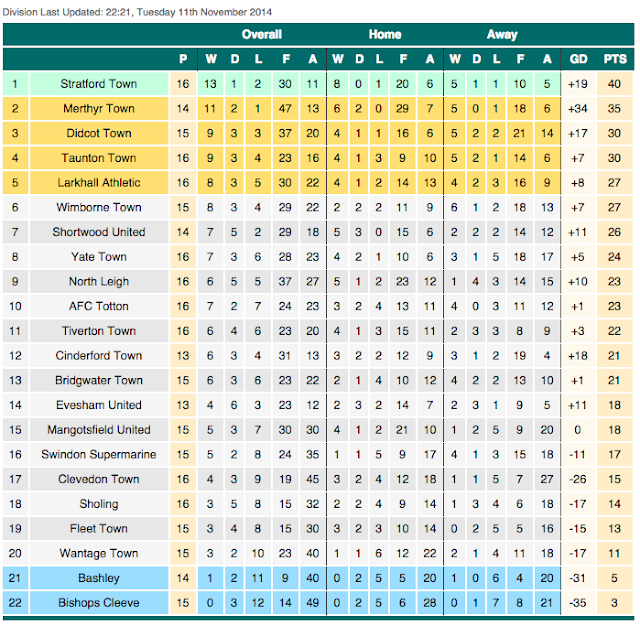 Last season they finished 9th in the Southern League D1 South & West, and at the time of the game they were a place higher in 8th. The club had their best ever FA Cup run in the 2012-13. They got all the way to the 1st Round, beating Conference title chasers Newport County along the way, eventually going out to Cheltenham Town. 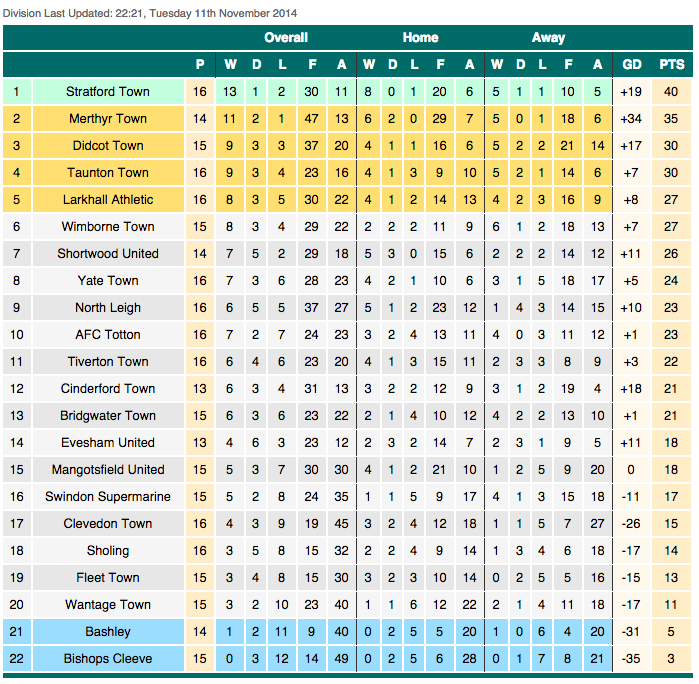 In the FA Trophy, they got to round 3 in 2005 before going out to Hayes. They also reached the 5th round of the FA Vase in 1992. Once again, it would be a Tuesday night groundhop for myself and Anwar. We would be a bit limited in choice, as I had a flu jab at 4.15. I factored in the fact that there could be delays, both on the roads, and also at the doctor's, so I factored in an hours delay on top of travelling times and made a list of games from there. There were a fair few, but none that jumped out as being must visits. In the end, I left it to Anwar, and he selected Quorn v Dunkirk from the Midland League. I was happy with that - I had been to the ground years ago to take pictures of the ground, and had been impressed with how smart it was and the people there were nice too. Even though the name reminded me of the fake meat that they make for vegetarians, and it wasn't on my immediate tick list, I was still happy to go. That was the plan up until Tuesday lunchtime at least, but more of that later. It was my day off as per usual on Tuesday. In the morning I went down town with my Dad, and got a few bits for the footy later on. As time would be tight, I went down to the doctors early afternoon to see if I could have my flu jab early, but they didn't start till 4. 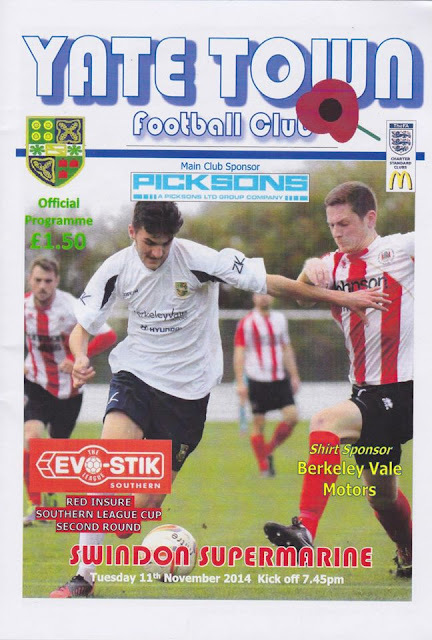 I had planned to go down a bit early and then go to a game at Carlton Town as it was a cup game, but it was too tight for time leaving just before 5. In the end, I went at my normal time, but the service at the doctors was excellent and efficient, and I was out even before my appointment was due to start, and well on my way. I got to Anwar's at 4.40 and after deliberating over the fixtures in the Non-League Paper that I had bought with me. After seeing that a few games in the Midlands had bitten the dust, that Quorn had no Twitter account and remembering the poor performance of the M1 last Friday, we decided against that game. 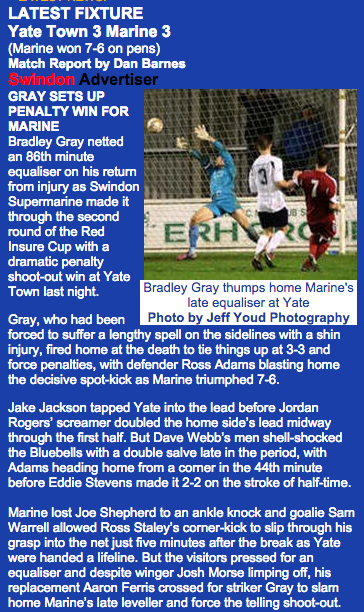 I fancied a step 4 or above, so in the end, we decided upon Yate Town v Swindon Supermarine in the Red Insure Cup. With an ETA of 19:19, we hoped that the traffic would behave. Despite it being very slow out of Aylesbury, and then on the single carriageway towards Bicester, once we got around the Oxford and Swindon area the roads got better and we made good progress along the A419 and M4. Something that was not welcome was the torrential rain, which I thought may put the game in doubt. I had Anwar checking Twitter on a regular basis so we could divert if needed, but thankfully the game was on and the pitch held up well in the end. We eventually got into Yate at 7.05PM, and with little to do, went in, paying a slightly steep £8.50 for entry and £1.50 for a programme. I had a walk around the ground, getting pictures and sussing out what I could use the time until kick off to do. I looked for the club shop, that was closed before the game, but open at half time. It was a more traditional non-league club shop, with lots of old programmes, but not much in the way of club merchandise. There were no programmes that I needed for my collection, so I made my way to the bar. I was pleased to see that they did a local cider, Black Rat, that I had at Melksham last year, exactly a year to the day in fact. I was happy to have a pint of that, and it was good value at £2.90, and very nice too. I picked up a free local pub magazine, to help me plan future trips. By then it was approaching 10 minutes until kick off, so I made my way outside and got myself a deceptively large portion of chips for £1.50. I took them to the stand and sat in the directors' seats, seeing as they were empty with the game about to kick off. The match was an entertaining 3-3 draw, with Yate going 2 goals up but surrendering their lead before half time. I was especially impressed with the visitors' number 11 Josh Morse, who looked a great winger. We also saw our first penalty shootout in 75 games, which was most welcome, as we had been hoping for one for ages. It was getting on for 9.55 when we left the ground, due to the penalties going on. I had to stop for diesel at Tesco on the way home, but being as it was 3p a litre more expensive, I only stuck a tenners worth in. I popped in the store and got some mince pie cookies and some chapattis for 9p each, as well as a drink for the way home. I also got a box of local cider - Somerset Tree Shaker - to take home with me, which was my main reason for stopping. The radio reception was dreadful on the way home for some reason, but in any case, we made good time, getting back to Aylesbury at midnight, with me getting home myself at 12.15. After 45 minutes checking Facebook and watching TV, I went to sleep around 1am, meaning I'd only get a few hours sleep, with me being up at 4am for work. 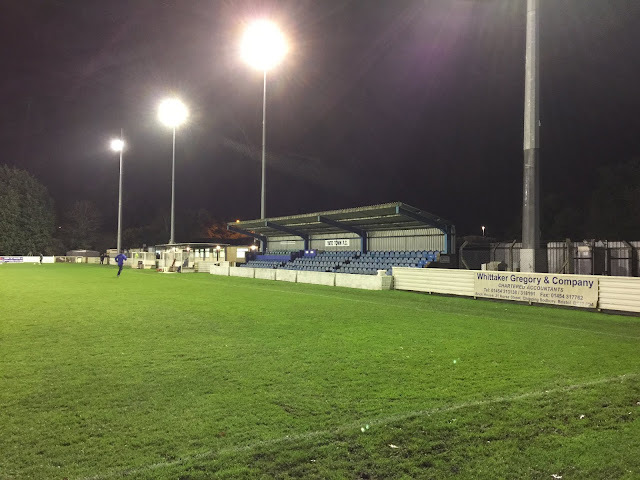 LODGE ROAD is a modern ground, but unlike other new builds, it has proper stands. There is a seated stand on the side you come in, that holds just shy of 250 fans. whilst the other cover is a terrace behind the goal, holding around 500. The rest of the ground is open, but it is surrounded by nice trees, which also act as cover in some cases. The bar is nice, offering a great range of drinks and is spacious with big screen TV and club related stuff on the walls. The tea bar offers your standard range of food with good portions and reasonable prices. The club shop has a good selection of old programmes. I didn't see a lot around the ground, with it being a fair way from the town.